The Volkswagen 1.9 litre turbo diesel engine has been around for a long time and has been used in many Audi / VW / Skoda / SEAT cars. Over the years it has also often been modified, especially in the pursuit of outright power. But in addition to power, in this new series we’re after four outcomes – keeping the cost as low as possible, achieving factory (or better than factory) fuel economy, and maintaining utmost reliability and normal levels of refinement. The 1.9 litre turbo diesel engine, as fitted to my Skoda Roomster, can be characterised as having practical and effective performance without at the same time ever being anything startling. Peak power is only 77kW at about 4000 rpm but the strong bottom-end torque of 240Nm at 1800 rpm means that throttle response is good and the engine can be short-changed with the torque being left to do the work. On the downside, going beyond 4000 rpm is rather pointless (redline is 4500) and open-road passing (especially when fully loaded) needs to be planned rather than a spur-of-the-moment decision. As for traffic light grands prix, it’s OK if the other person is asleep. Fuel economy is very good, with in my normal use between 5.5 – 6.0 litres/100 km being achievable in all conditions. All internal combustion engines pump huge quantities of air. A diesel, a design that doesn’t regulate airflow with a throttle, typically has a much higher airflow than an equivalently-sized petrol engine. In fact, off-boost, the diesel always flows the equivalent of the airflow achieved by a same-size naturally aspirated petrol engine operating at full-throttle! And, with a turbo diesel being on boost for so much of the time, the actual airflows can easily be more than 50 per cent higher than the swept volume. In short, for maximum power and minimum fuel consumption, allowing a diesel to freely breathe is not just important, but because of the huge volumes of air going in and out of the engine, is also much harder to achieve than in a petrol engine. The Roomster’s intake (as with many VW/Audi/Skoda products fitted with this engine) is a mix of the good, the bad and the downright ugly. 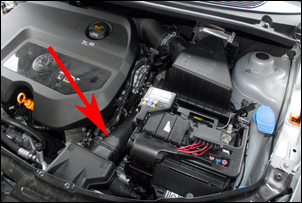 Starting at the beginning of the intake system, air is drawn-in through an opening in the panel above the radiator. (Note that the grille has been removed to take this photo.). The intake is sited at a position of high aerodynamic pressure (this isn’t just theory; the pressure build-up can be easily measured – more on this in a moment). The rectangular opening is also very large – about 15 x 5cm, or 75 square cm. 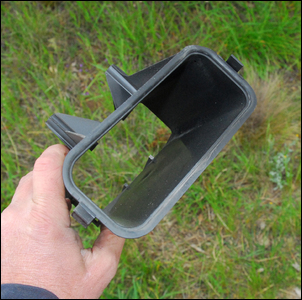 Collecting air from this large opening is a rectangular plastic moulding that has an inlet area of about the same cross-sectional area as the panel hole – again, excellent. However, for some bizarre reason, the exit to this moulding is, in relative terms, tiny – just 15 square centimetres! That’s right, the intake necks-down by no less than 80 per cent! 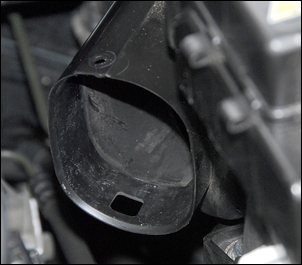 Backing this tiny inlet is a flexible tube that caries the air to the airbox. This starts off with a cross-sectional area of about 30 square centimetres and joins the airbox with about 42 square centimetres cross-sectional area. However, weirder and weirder, the actual opening in the airbox wall (not just the pictured attachment point) is much larger again – I don’t have a measurement close to hand but it’s about 50 square centimetres, ie about the same as an 80mm diameter tube. So where does all that leave us? 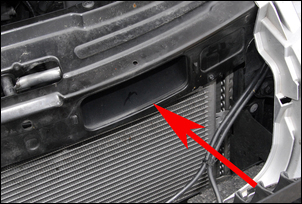 In short, the opening in the panel above the radiator (ie the mouth of the system) is very generously sized at 75 square centimetres, and the opening in the wall of the airbox is also very good. But in between those extremes, all sorts of restrictions to flow are present. And inside the airbox? It looks excellent. 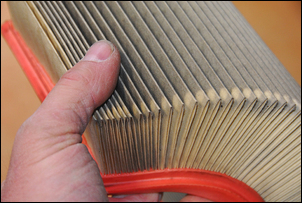 The paper filter is large in area and has very deep pleats, increasing much further the area of paper exposed to the flow. The exit to the airbox is a well-shaped bell-mouth that, despite being positioned relatively close to walls, previous testing has shown to flow very well. I didn’t investigate the pipe between the airbox and the rear-mounted turbo but what could be seen looked fine – the problems were in the front part of the system. After inspection, the next step was to make some measurements of the actual intake flow restrictions. So how do you do that then? 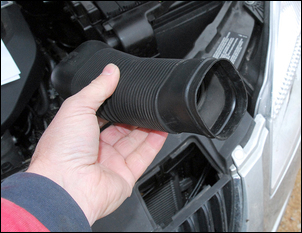 It’s easy to measure flow restrictions in the intake when the engine is working. Flow restrictions will show up as pressure readings that are below atmospheric. That is, if there’s a restriction to flow, not all the air available from the atmosphere will ‘get through’ – resulting in a pressure drop. 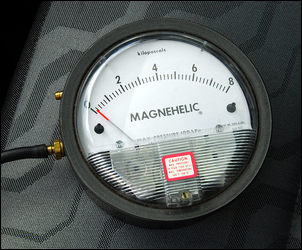 Measuring pressures below atmospheric can be done with a manometer or a Dwyer Magnehelic gauge. 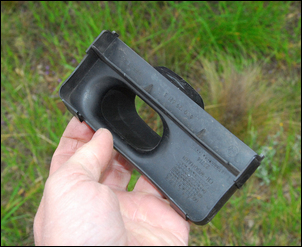 The easiest on-road approach is to use the Dwyer Magnehelic gauge (other manufacturers also make similar gauges but they're not nearly as common). These gauges are incredibly sensitive to very small pressure variations and have superb, clear markings and a large size. These gauges can be picked up at industrial junk places and on www.ebay.com for $10-$40. Pick a gauge that has a range of 0-20 or 0-30 inches of water, then if you find yourself using this gauge a lot, go for a second more sensitive gauge (eg 0-10 inches) so you can see what's happening in more detail. 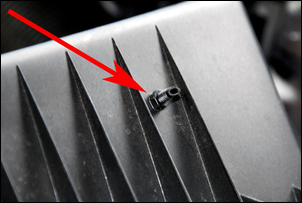 Over the years I have bought a range of Magnehelic gauges that can do everything from measuring intake flow restrictions to allowing me to plot aero pressures on the bodywork of the car – including measuring the pressure build-up in front of the Roomster’s radiator. If looked after, these gauges will last forever. But if you want a cheaper approach, make your own manometer. This'll take you about 5 minutes and cost very little. You need: a plastic soft drink bottle (1.25 - 2 litres), a metre of so of dowel (any small bit of wood will do), sticky tape and 4 metres of small-bore flexible clear plastic tube. Attach the wood to bottle, so when bottle is sitting upright, the wood protrudes vertically above it. 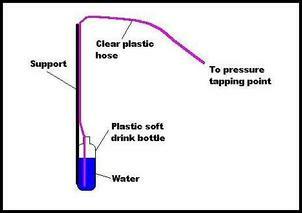 Attach the plastic tube along length of the wood, one end of the tube going to the bottom of the bottle. There will be lots left over at the top. As the airflow rises and so the intake system starts to become restrictive, the measured pressure drop will increase. To put it simply, with increasing load the water level will rise higher in the manometer, or the Magnehelic gauge will show a greater negative pressure (sometimes also called a ‘vacuum’). 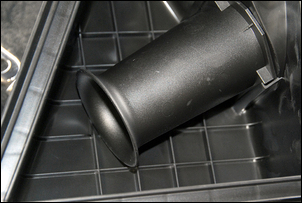 I decided to measure the total intake flow restriction to the turbo side of the air filter – that is, the restriction taking into account the filter, airbox, flexible intake tube, restrictive entry to that duct, and the mouth placed through the large over-radiator hole. 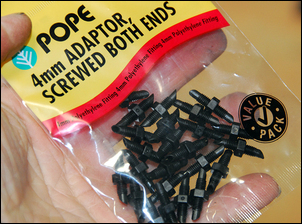 ...into which one of these miniature plastic irrigations fittings was screwed. 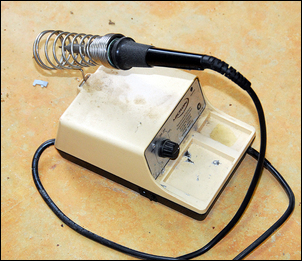 This gave a pressure tapping point that was easily attached to and, when the testing was complete, could be unscrewed and the hole covered with a smear of black silicone, making it invisible. The testing was done on-road at full throttle in second gear, with the data measured at 500 rpm intervals. This graph shows the results. The pressure drop peaked at just under 14 inches of water at 3500 rpm and then held at 12.8 inches of water at 4000 and 4500 rpm. So, is that result bad or good? Over the years I’ve measured plenty of pressure drops of intake systems. Fourteen inches at the exit to the airbox is about middle of the road – it’s by no means the worse (try about 31 inches!) and it is also by no means the best (about 4!). In short, especially for a diesel that is breathing a lot of air even when off-boost, there is opportunity for substantial improvement. 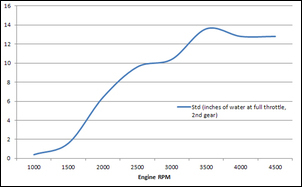 I also measured the actual, on-road acceleration through the rev range, also in second gear. This was done using an accelerometer (see Ultimate DIY Automotive Modification Tool-Kit, Part 5 for more on this technique) and it showed that acceleration peaked at 0.32g at 2000 rpm – not coincidentally, at around max torque. In fact, you can pretty well assume that this measured acceleration curve matches the shape of the engine’s torque curve. 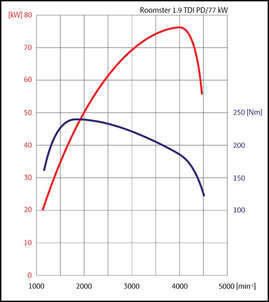 Comparing the acceleration curve to the factory specification torque curve shown earlier on this page (one that was probably measured in a steady-state condition, rather than during acceleration) shows the turbo in the Roomster being a bit slow to come up on boost – and then arriving with a rush – and the engine having a small mid-range torque hole not shown on the factory curve. 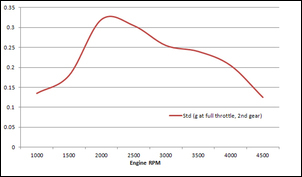 The intake system of the 1.9 litre turbo diesel has obvious potential for improvement. While both ends of the intake are good, in between there are clear and measurable restrictions. Part 2 of this series: making a new low cost intake that drops measured restriction by 69 per cent! But does it improve performance?